A 50 year-old-gentleman presents with a very slow growing right submandibular nodule. His history is significant for stage IV low grade follicular lymphoma diagnosed fifteen years earlier. At that time, he had extensive bone marrow involvement and circulating malignant lymphoid cells but no lymphadenopathy. In light of his history and currently slow growing nodule, a PET scan was performed. A few bilateral cervical lymph nodes and multiple bilateral pulmonary nodules were identified. Aspiration cytology of the submandibular nodule demonstrates a monophorphous population of small cells with scant cytoplasm and irregular (cleaved) nuclear contours. 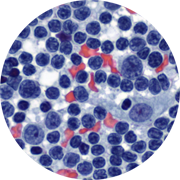 Scattered large cells, cytologically immuoblasts, are present in the background. Flow cytometry shows a CD10+ B-Cell non-Hodgkin lymphoma consistent with follicle center origin. A diagnosis of recurrent follicular lymphoma, grade 1-2, was assigned.